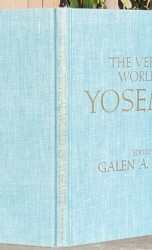 This is the first printing of the first edition of THE VERITCAL WORLD OF YOSEMITE by Galen Rowell. This book was published in Berkeley by The Wilderness Press in 1974. 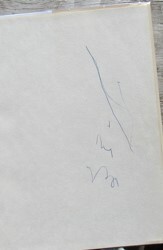 This book has been SIGNED by Galen Rowell on the first blank page in blue pen. First editions of this book signed by Rowell are considerably scarcer than examples of it signed by other Yosemite climbers. Rowell, his wife, and two others were killed in a small plane crash near Bishop CA in 2002. 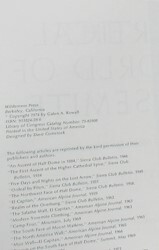 The book measures 286mm tall x 215mm, and has 201 pages, 115 b/w & 16 color photos. This is the first substantial book describing the history of the major technical climbing routes in Yosemite Valley in the Sierra Nevada of California. This was Galen Rowell's first book, and is now a classic in the literature of mountaineering. The book is large format & full of many photos that were taken during the first ascent climbs and attempts of the classic routes. It covers many of the earliest major climbs up through the early 1970s. 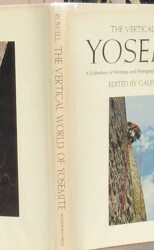 The chapters are written by the climbers who pioneered the routes. Chapters are by Royal Robbins (4 chapters: The Salathé Wall El Capitan, The North American Wall, Tis-sa-ack, interview), Yvon Chouinard (2 chapters: Muir Wall El Capitan, Modern Yosemite Climbing), Bestor Robinson (The First Ascent of the Higher Cathedral Spire), A. Phimister Proctor (An Ascent of Half Dome in 1884 [one of the earliest 'technical' climbs in the Sierras]), Anton Nelson (Five Days and Nights on the Lost Arrow), Allen Steck (2 chapters: Ordeal by Piton, Robbins interview), Michael Sherrick (The Northwest Face of Half Dome), Warren Harding (2 chapters: El Capitan [the first ascent of the Nose], Reflections of a Broken-down Climber), Allen MacDonald (Realm of the Overhang), Doug Robinson (Camp 4), Galen Rowell (3 chapters: Rescue on the South Face of Half Dome, Introduction, Robbins interview), Ken Wilson (Robbins interview). GALEN ROWELL and his photographs won many awards including the Ansel Adams Award. His photographs have been exhibited at the International Center of Photography, the California Academy of Sciences, the Smithsonian, the Ansel Adams Gallery, etc. Rowell wrote several excellent books and his work has been published in many prominent magazines. Sadly, Rowell and his wife, Barbara, were killed in a small plane crash in 2002 while approaching the landing at Bishop, California. Rowell had an amazing record of climbing and exploration: over 100 first ascents of routes in Yosemite Valley and the High Sierra Nevada; the first one-day ascent of Mt McKinley, aka Denali, in Alaska; the first ascent of Great Trango Tower in the Karakoram; the first ski ascent-descent of Mustagh Ata; the first ascent of the NE Ridge of Amne Machin (second ascent of the mountain by few days); the first ski circuit of Denali; about 40 expeditions to remote peaks including Nun Kun, K2, Mount Everest, various Karakoram peaks & spires, Patagonia, Kilimanjaro, Gasherbrum II, Alaska, Yukon, Canadian Rockies, etc. CONDITION: Original blue cloth with gilt lettering on the spine. Some doodling? pen marks on the blank FFEP (see photos) otherwise no previous owner marks or writing on any pages, clean covers, solid binding, no foxing, overall excellent condition. The typically fragile and brittle dust jacket is in better than average condition for this book: small loss top of spine and tip of one corner, small loss lower front, two clean 3cm tears upper rear, original price intact on flap corner. 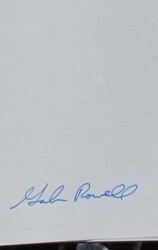 Rowell's signature is clear & strong without fading or smudging. Price: $325.